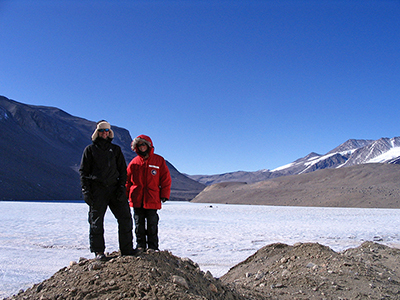 Student researchers take a break to pose near an Antarctic lake. The Center for Aquatic and Watershed Sciences does not offer any academic programs per se, but undergraduate and graduate students have several related Miami programs from which to choose. Students can conduct research with CAWS faculty while pursuing their degrees and Miami offers a wide variety of relevant courses. The Center for Aquatic and Watershed Sciences (CAWS), in the College of Arts & Science, was established to promote research and education on the linkages between watersheds and aquatic ecosystems. CAWS brings together faculty, students and staff from several departments in a collaborative environment to address these and many other questions related to watersheds and aquatic ecosystems.